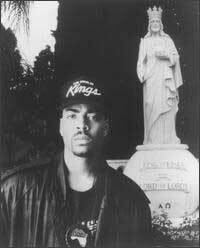 Disciples of Christ (D.O.C.) "We've really been able to express who we are in these last couple years, particularly on this Righteous Funk album. Of course, as Christians, we are the righteousness of Christ. Secondly, that's funk." That's Ben Reges (born Alton Hood) representing Disciples of Christ (D.O.C.) on behalf of himself and his partners Prophet (Michael Brown) and Absalom (Kelvin Harvey) for their third Star Song set of slammin' jams, Righteous Funk, as the man said. "That's where we've come from," says Alton of the Disciples' funk heritage, "We come from the '70s era of funk: Parliament, Earth, Wind & Fire, Heatwave. So, it was really great that we were able to express and come forth with that and introduce the Christian market to something they might not have ever known about." Though Righteous Funk is the truest D.O.C. has yet been to the funky sounds absorbed in their younger days, Christian music listeners were introduced to the trio in 1990 with a cut on a Star Song rap sampler. That led to 1991's full length debut, So How Ys Livin'?, and the even more potent funk bomb dropped in '93, Pullin' No Punches. Before any of this, the three brothers on a mission had to be introduced to the Lord. As with much concerning D.O.C., that was a bold move, too. Relates Alton, "We started back in 1987. Kelvin Harvey and I were attending Oberlin College at that time. Basically we were into the world. We both had scholarships to play football. We didn't have Christ in our lives, so we began to party and live the high life, hanging out with girls, that whole party life. We had this void in our lives. So what happened was that I was introduced by some friends to the occult. It got pretty serious." In fact, so serious that the drugs and alcohol their fellow occultists were using on them in initiation rites became addictions. At the time they were to reach 'the next level,' he proclaims, "Praise God, through a supernatural manifestation of the Holy Spirit, God's power came down right there in the room, saved me, delivered me right there on the spot and just cleaned me up." It didn't take long for Hood, Harvey and friend Brown/Prophet to do what they did at the parties, 'beatboxing and rapping' for a higher calling. In D.O.C. 's history, however, some things have changed. For instance, over their three albums, Brown has come to the forge as a dynamic tenor singer. All three harmonize with the precision of the best of the male vocal groups all over mainstream and R&B radio. Since D.O.C. is a much about rapping as they are about singing, they have something to clear up: "We're not a rap group. We're a vocal hip hop R&B band. What we want to do is let people know Disciples of Christ's ministry is a full-fledged ministry. Now this is the time of the g-funk era, so you have a bit of the singing with the rap. Whatever is happening and whatever we feel can best get the message across," says Hood of D.O.C. 's musical ministry. Even for musicians, rappers, and singers, ministry isn't all about the art in which they are working. "We believe that our life is a ministry," he affirms. "We are men of God first and musicians second." With that in mind, the trio has relocated this summer to the Tulsa area of Oklahoma from their original northern Ohio base. This is not only to be closer to their management, but as a way of getting closer to the God they serve. As they are "stepping out in faith, like Abraham," Alton believes God will open the doors for all the group to attend Dr. Kenneth Hagin's Rhema Bible Training Center. This is so they might "sit under the Word of God, that the calling of God upon our lives will be confirmed and that our roots will go down deep into the will of God for our lives." Before leaving for parts south, however, it was the group's good fortune to work with '70s funkateer Bootsy Collins, who is known for his collaboration with James Brown and George Clinton, and who went on to head up Bootsy's Rubber Band from the mid-'70s to mid-'80s. On Righteous Funk numbers such as "Hollywood" and "Wind Me Up," Collins was able to bring in renowned instrumental associates like Maceo Parker, Bernie Worrell and Fred Wesley. Though dressing elaborately as ever, Collins is someone about whom Alton is proud to say, "He attends a full-gospel, Holy Spirit-anointed church. Oh, yes." Godly as they become, it's Disciples of Christ's humility that puts Hood, Brown and Harvey in the position of saying of their music's evangelistic and edifying aims: "We would have even more young people that would come into knowledge of what God is doing through D.O.C. 's ministry," and hence, what God can do in these young people. Can't get much funkier than that now, can you?